The Junior Wildlife Ambassador Program (JWAP) is an outreach education program, whereby WILDNorth goes into elementary schools to educate students on the importance of wildlife in our community and empower each student to take action in their own community. 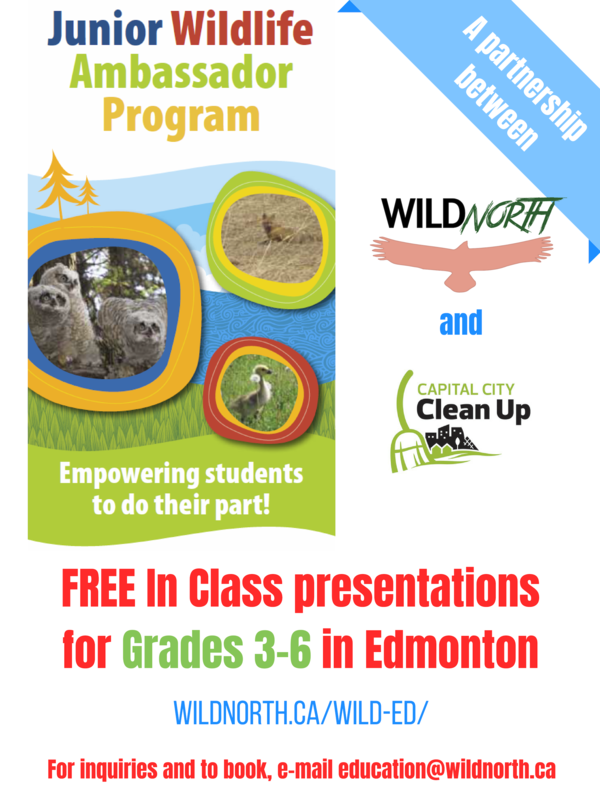 WILDNorth offers free, curriculum-specific presentations for Grades 3, 4, 5, and 6 in Edmonton thanks to Capital City Cleanup. This is a 30-minute presentation providing students with the opportunity to explore and learn about the life cycle of a local songbird. Linked directly to the Animal Life Cycles unit, this program offers a fun and tangible way for students to learn about a full life cycle while developing an awareness and appreciation for backyard nature. Since a clean community is a shared responsibility, the Wildlife Rehabilitation Society and Capital City Clean Up have joined forces to deliver the “Litter, Wildlife & My Community” classroom program. Educational and entertaining, this 60-minute presentation directly links to the Waste and Our World unit. It illustrates how litter harms wildlife and helps students identify actions they can take to minimize litter’s impact on wildlife. “Wetlands, Wildlife & My Community” takes students on a 60-minute virtual exploration through the Wetland Ecosystems and examines how human activities can threaten the survival of wildlife in these sensitive ecosystems. A clean environment is a shared responsibility; the goal of the WILDNorth and Capital City Clean Up is to empower students to do their part. Linking directly to the Trees and Forests unit, “Trees, Wildlife & My Community” is an interesting and enjoyable 60-minute investigation into the interactions between trees and the numerous wildlife species that students find in the boreal forest and in their own backyard. Because most of the wildlife patients WILDNorth receives each year are injured due to human-related activity, this program helps students gain the tools to make a difference and lessen their impact. This interactive 60-minute presentation focuses on living with urban wildlife – giving general information about wildlife in Edmonton, encouraging the students to think critically about the public’s role with wildlife, empowering them to do their part for wildlife in the community, and increasing awareness of the impacts human development can have on wildlife. This program illustrates the human-wildlife interactions that happen when the line between “City” and “Wild” becomes blurred, and provides students with tools necessary to ensure these interactions are positive.